Develop a unique way to get their foot in the door with large construction companies that will then hire RW Engineering as a subcontractor. Compile a list of the top 30 firms they wanted to attract and place together a powerful direct marketing piece with a follow-up strategy. Everyone that receives a box is always curious on what is on the inside so we leveraged people’s natural curiosity. 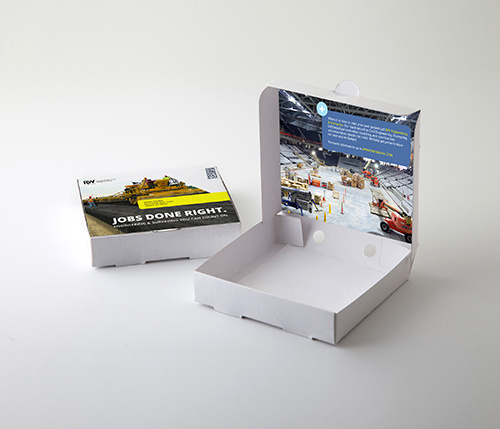 We had custom wrapped boxes hand delivered or shipped via priority mail with RW’s marketing material inside that helps to tell their story quickly and succinctly. Inside was an invite to connect or to meet up at an upcoming industry tradeshow.